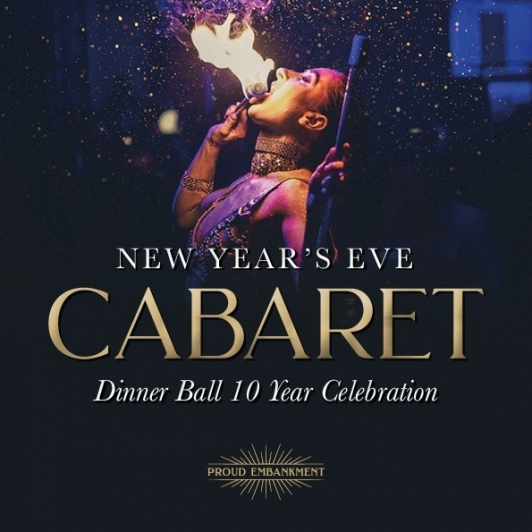 Alex Proud welcomes you to celebrate on New Years Eve for 10 Years of Proud Cabaret! Seated on our Mezzanine level, enjoy our fabulous Christmas variety box and an arrival cocktail. An Arrival Cocktail & a Delicious Three Course Meal whilst being dazzled by an Award-Winning Cabaret Performance. PLEASE CHECK YOUR EMAILS FOR TICKET COLLECTION DETAILS - YOU MUST HAVE A WRISTBAND TO ENTER. Alex Proud invites you to celebrate 10 years of Proud Cabaret with our most spectacular cabaret show yet featuring International circus performers, aerial artists, fire breathers and acrobats. Enjoy a three course dinner and choose from our exclusive Prohibition era cocktail menu. With Proud you can party into the New Year Dress to impress and leave your inhibitions at home - there is no other show like this in town. Arrival is between 7pm-7.45pm with dinner being served from 8pm. The cabaret show will kick off from 8.30pm with dazzling acts who you'll bring in the New Year with. Tickets start from £100pp and please do check out our facebook event page for line-up. Please note: this is a dress to impress event and a 15% service charge will be added to your bill.